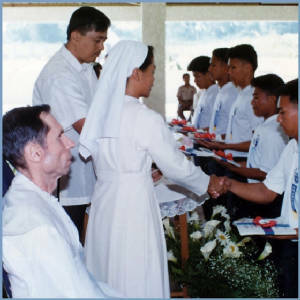 In his book, Killing Me Softly, Msgr. 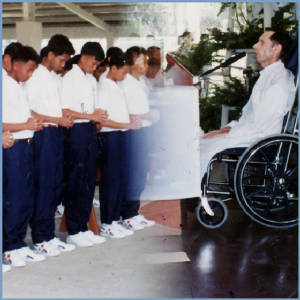 Al vividly describes his battle with ALS in the last three years of his life, which he considered as the sum total of the 57 years or so which preceded them. Strange as one may see it, but he considered his sickness as a gift from God. One night in July of 1989, he woke up in the middle of the night with a strange sensation in the biceps of his right arm. The muscles started twitching, and it continued. This would mark the start of his battle with Lou Gehrig’s disease. 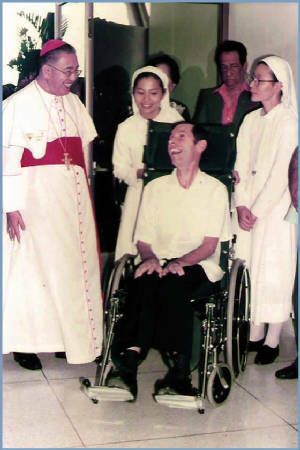 In October of 1989, as his muscles continue to deteriorate, he consulted various well-known doctors in the United States, who gave him their services free of charge. 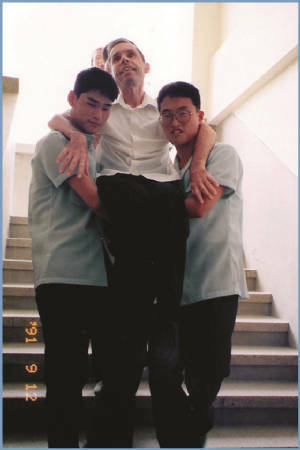 After a series of tests, the result was that he had a fifty-percent chance to have contracted what is called Amyotrophic Lateral Sclerosis. Upon hearing this, he asked, “Is this disease life threatening?” The doctor told him the usual period of time was three years. ALS brought him many sleepless nights, as sleep disorder is one of the frequent problems of ALS patients. He would wake up in wee hours after a mediocre sleep not from tossing and turning all night because tossing and turning are luxuries which are denied the ALS patients, but from pain in his arms, legs and all over his body. He would also suffer bad falls trying to help himself stand. As the disease is described as “terminal” and “very cruel and demeaning”, he writes, “Right now, I have very little control over my environment. I have lost all independence and so-called dignity. However, I do not find this all that devastating. I think of Jesus, Lord and Master, who had all power in heaven and earth, yet He deigned to become a small infant. He entrusted Himself totally to the Virgin of Nazareth.” Msgr. 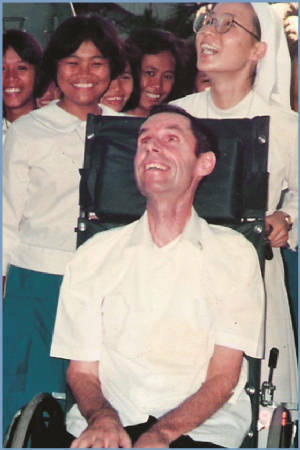 Al became totally dependent on the help of others and so he considered the Sisters who were taking care of him as his angels of mercy. In officiating Mass, flies landing on his nose or his forehead added to his agony. Also at Mass, he had to struggle to keep his head erect to avoid having it fall down on his chest. If so, a Sister would come to lift it back again. He also became extremely sensitive to cold and heat. But, what struck Msgr. Al the most in his sickness is that it kept him from running, the only secular diversion that he loved. As the disease progressed, his health deteriorated and declined. He writes about his thoughts on life-support system. “[…] normally, an ALS patient, in the final stages of illness can no longer speak. However, the eye muscles are never affected by the disease. In the last five or ten years, technicians have developed sophisticated computers with voice synthesizers which can be activated by simply winking and blinking your eyes. The good news is that, even if you are on life-support systems, breathing through a tube in your throat and eating through a tube in your stomach, you can still communicate with the outside world. I personally feel a certain revulsion at the thought of being hooked up to these life-support systems. The idea of lying there, totally paralyzed, breathing through a hole in your throat, eating through a tube in your stomach and speaking through a computer by winking and blinking your eyes, holds little appeal for me. My gut instinct at this point in time, although it is quite possible that later I may change my mind, is to let nature take its course and to accept death without trying to outwit it by any extraordinary means. Some ALS patients who are on life-support systems are held up as heroes. They are spoken about as models of courage, determination and as having the will to live. This is one point of view. An equally strong case can be made for the opposite. It can be argued that it is just as courageous, heroic and noble to accept death with calm, dignity and serenity as it is to accept a prolonged illness and disability with the same calm, dignity and serenity. 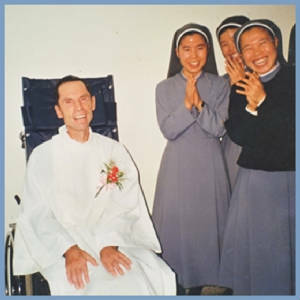 However, those closest to me, namely, the Sisters of Mary, all seem to feel rather strongly that I should hang on to life as long as possible, even though I am hanging only by my fingernails. They even make me feel, at times, that to choose a different course could somehow be interpreted as being a coward. 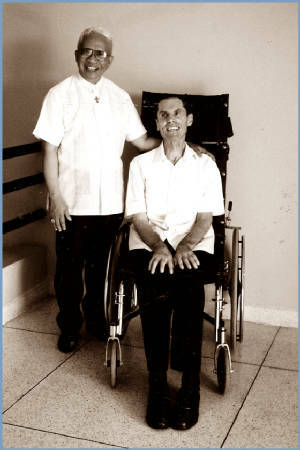 On his wheelchair, Father Al continued to perform his obligations as a priest and a spiritual father to the Sisters and Children.